To check the steering wheel free-play, stop the car with the wheels pointed straight ahead and gently move the steering wheel back and forth. Use very light finger pressure and be sensitive to changes in resistance that mark the limits of the free-play. If the free-play is greater than specified, have it inspected by your Hyundai dealer and adjusted or repaired if necessary. With the engine off, press lightly on the clutch pedal until you feel a change in resistance. This is the clutch pedal free-play. The free-play should be within the limits specified in the illustration. If it is not, have it inspected by your Hyundai dealer and adjusted or repaired if necessary. With the engine off, press down on the brake pedal several times to reduce the vacuum in the brake booster. 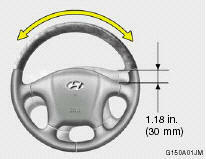 Then, using your hand, press down slowly on the brake pedal until you feel a change in resistance. This is the brake pedal free-play. The free-play should be within the limits specified in the illustration above. If it is not, have it inspected by your Hyundai dealer and adjusted or repaired if necessary.